Both SpeedCurve Synthetic and LUX support custom timers via the User Timing spec. Here's how to get started, including six sample metrics. No one knows your website as well as you do. Therefore, it's important that you add custom metrics that measure the content that you and your users care about most. This allows you to track the speed of what your users are experiencing in both synthetic and RUM. The W3C User Timing spec provides an API for developers to add custom metrics to their web apps. This is done via two main functions: performance.mark and performance.measure. 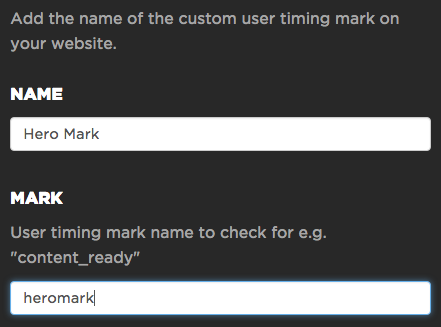 There are other User Timing APIs, but mark and measure are the main functions. Once your page is chock full of marks and measures, the question arises as to how to actually collect these metrics so you can track them. Thankfully, because User Timing is an official W3C specification, many metrics services automatically extract and report these custom metrics in their dashboards. This is true for SOASTA's mPulse, WebPageTest, and SpeedCurve. While the User Timing API is simple, it can sometimes be difficult to know where and when to capture these marks and measures. This is due to the complexity of the browser's inner workings, primarily the way that stylesheets and synchronous scripts block parsing and rendering. Let's look at a few examples of likely custom metrics to gain a better understanding. A quick note about browser compatibility: User Timing is available in most browsers except Safari. In the examples below we use the native API, but in your live code you'll need to check for compatibility and either use a shim or wrapper. A good polyfill is available from Pat Meenan. Inline scripts are not executed until all previous stylesheets are downloaded, parsed, and applied to the page. Therefore, placing the inline script after the LINK tags ensures that the mark is set after all the blocking CSS has been processed. It's possible that a stylesheet might include @import which would pull in other stylesheets, for example, sheet1.css might cause sheet2.css and sheet3.css to be downloaded, parsed, and applied. Therefore, simply tracking a stylesheet's load time (with Resource Timing for example) isn't enough. Doing so would produce a measurement that was too short and underestimated the impact of stylesheet blocking. In order to produce a good (fast) user experience, it's important to understand what might be blocking your web app's rendering. The likely culprits are stylesheets and synchronous scripts, but often it's hard to disambiguate which is responsible for delayed rendering. This "stylesheets done blocking" custom metric is handy because if rendering starts well after the "stylesheets done blocking" metric, then the investigation should focus on synchronous scripts, which leads to our next example. The inline script (which calls performance.mark) is guaranteed to execute after script a.js has been downloaded, parsed, and executed. On the other hand, the mark will be recorded before b.js is done loading because b.js has the async attribute. This behavior matches our goal of measuring script blocking because a.js blocks rendering, but b.js doesn't. Capturing an accurate "scripts done blocking" metric is a bit more challenging than its stylesheet counterpart. The reason is that, similar to stylesheets, the User Timing mark must be placed below all synchronous scripts. This can be difficult since websites frequently sprinkle scripts throughout the page. If that's the case, the mark measurement may occur after earlier DOM elements have rendered, and thus it doesn't accurately measure when rendering starts. Therefore, this example is only useful for pages that have their synchronous scripts in the HEAD. Even with this limitation, this custom metric can be very useful for pages that have large scripts where the blocking time is much longer than the download time due to parsing and execution. When looking at waterfalls for these types of pages, all the scripts finish downloading but there's still a long gap before rendering starts. With a "scripts done blocking" mark, it would be possible to identify long parse and execute times as the culprit for render blocking. If your site uses custom fonts, it's important to know that some browsers won't render the text that use those fonts until after the font file is downloaded. In other browsers the text may be rendered in a system default font and then re-rendered ("flash"ed) when the custom font is loaded. Therefore, a "fonts loaded" custom metric would be valuable to indicate when text elements were rendered. Currently, there is not an "onload" event for fonts. Nevertheless, there are techniques for observing fonts and determining when they load, for example, Font Loading Revisited with Font Events by Scott Jehl from the Filament Group as well as Web Font Loader used by Typekit and Google Fonts. You could use these to track when your fonts are done loading, and include a call to performance.mark to set the "fonts loaded" custom metric at that time. The innovation is to take the greater of the image onload mark and the inline script mark. This accurately captures when the image is actually rendered. The image onload mark reflects the render time when the image download takes longer than any blocking resources. The inline script mark reflects the render time when the image downloads quickly but blocking resources prevent it from being rendered. In many cases, the most critical content in a page involves images, so this snippet is useful for a wide variety of custom metrics. Surprisingly, one of the most challenging custom metrics is determining when text is displayed. In addition to being blocked by stylesheets and synchronous scripts, text elements (P, SPAN, LI, DIV, etc.) can also be blocked from rendering if they use a custom font that takes a long time to download. If the text element DOES use a custom font, then the render time is the maximum of the inline script's mark and the font loading mark (see previous example). The key here is to use a pattern similar to the hero image where we record the "text displayed" mark twice: once in the font-loading snippet and again in the inline script after the text element. Additionally, we clear any previous marks of the same name before setting the new mark, thus ensuring that we get the maximum of the two values which properly reflects when the text is displayed. One of the drawbacks of relying on page load time as a metric is that it doesn't measure user actions inside a single page app (SPA) where window.onload only fires once but the user might perform multiple actions, each of which should be measured. Custom metrics solve this problem, but it requires taking on the added responsibility of creating an appropriate start time. A big benefit of building custom metrics with User Timing is that many performance metric services automatically extract the User Timing marks and measures to show in your performance dashboards. WebPageTest does this, and since SpeedCurve is built on top of WebPageTest we do it as well. You can add multiple custom metrics to SpeedCurve Settings. Since some pages contain dozens of marks and measures, including ones set by third party scripts, this step ensures that only the most important custom metrics are shown. Custom metrics are visible on various SpeedCurve dashboards. For example, the Site dashboard shows a trendline of our "Hero Mark" custom metric over time. It's extremely valuable to see custom metrics on a waterfall chart. This allows you to "debug" if your custom metric is measuring the right thing. 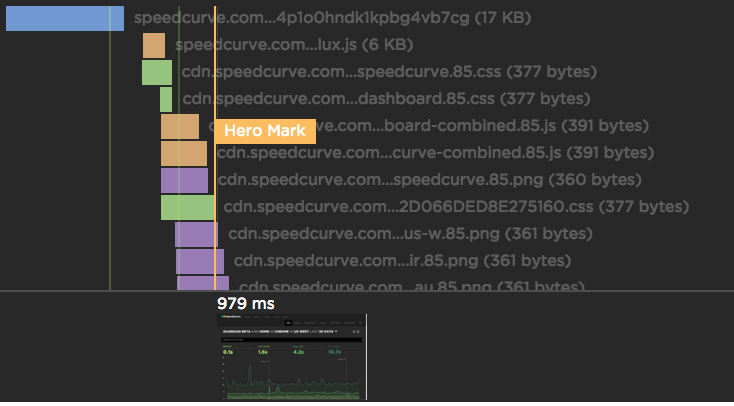 For example, in the waterfall below for speedcurve.com, we can see that the "Hero Mark" custom metric is blocked until all the preceding scripts (orange) and stylesheets (green) are done downloading. Using the thumbnails at the bottom confirms that this is when the hero image (the chart) actually gets displayed. 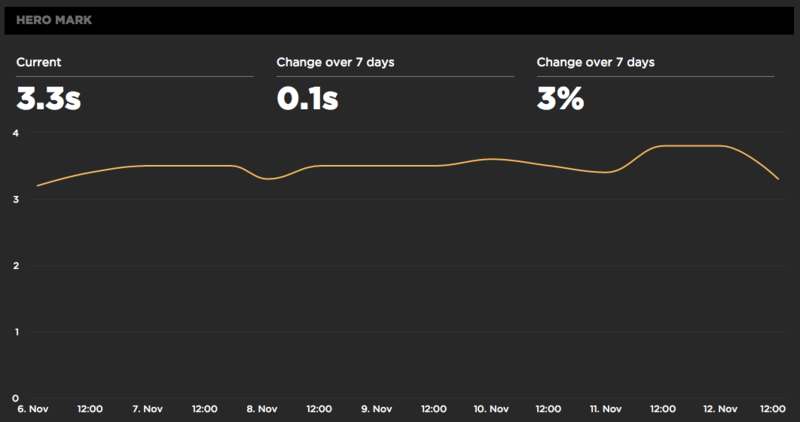 If you're not already using SpeedCurve to create custom metrics and monitor your site's performance, set up your free trial here.